This hanger is made for a schedule 40 3" I.D. pipe which is 3-1/2" O.D. Determine spacing of swing hangers on pipe by consulting either Figure 23, Table 7 for commercial swings, or for residential sets see spacing dimensions for ASTM 1148 diagram. Mark pipe with correct spacing. Place the two halves of the hanger around the pipe. The round swinging pendulum will be facing downwards. The side bolts are placed with the heads on the top of the hanger and the threads facing downwards with the nuts on the bottom. Tighten the side bolts to touch and using no more than 25 lbs of torque. The top and bottom hanger do not have to be flush. There can be a space between the two halves. After tightening, the threads should not be showing more than two threads past the nut, and the hanger should fit snuggly on the pipe. Grease or oil bushings if squeaking noises are heard. 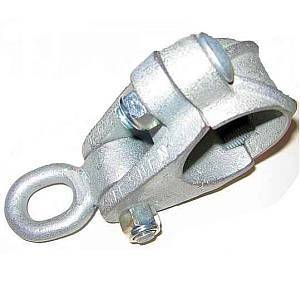 You will need to use S-hooks or H-shackles from the chain to the swing hangers. Make sure the S-hooks are closed to within .04 to meet ASTM safety standards. To do this you will need to use our S-hook pliers or a regular pair of channel lock pliers. Close according to Fig A1.19 for Fastening Devices. Any damage from vandalism, abuse, and/or misuse VOIDS all warranties.